This week, we’ll check out new releases from around the world that have caught my ear lately, and pay homage to the immortal Chuck Berry. We begin with veteran saxophonist Jimmy Greene’s new CD Flowers, featuring a stunning vocalist named Sheena Rattai, who is part of a folk-rock group in Winnipeg, Manitoba. She hits a high note on the title track that is really something. Then we hear from Cape Verdean singer Elida Almeida, a bright new star on the music scene who brings us a sweet dose of Cape Verdean morabeza. We turn to two Malian groups—Tamikrest, followed by the better-known Vieux Farka Touré, son of the late Malian bluesmaster Ali Farka Toure. Keeping it in a blues mode, we hear a live album recorded on a 2016 tour by Gary Clark, Jr., here singing a Jimmy Reed classic, “Honest I Do.” (I love Jimmy Reed by the way.) The Gentlemen’s Dub Club comes next, followed by Ondatrópica, a Colombian outfit put together by U.K. producer Will Holland, better known as Quantic. We move on two new jazz sides from pianists Christian Sands, the pianist in Christian McBride’s current group, followed by a wonderful duet album by New York City’s Randy Ingram, featuring Drew Gress on bass. The song is the strange, mysterious “The Peacocks” written long ago by Jimmy Rowles. Finally, we remember Chuck Berry, whom most consider the Godfather of rock and roll. By “most” I mean not only regular folk like you and me but people like Bob Dylan, The Rolling Stones, The Beatles, Bruce Springsteen, and countless other musicians. Berry’s guitar progression, his lyric poetry, his rhythms, and his stories-told-in-song put him at the highest echelon of pop greats. A recording of his song “Johnny B. Goode” is out in interstellar space on the Voyager Spacecraft, awaiting interception by curious extraterrestrials. 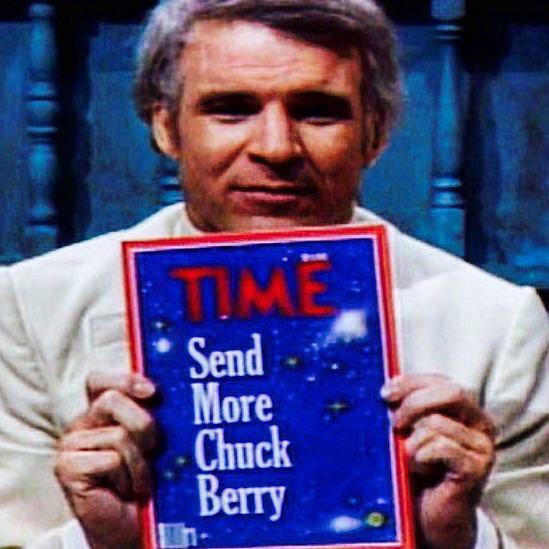 I love that in the year after the Voyager launch, in a “Saturday Night Live” skit, Steve Martin’s character Cocuwa reported that extraterrestrials had encountered the Voyager and sent word back: “Send more Chuck Berry!” Somehow this response doesn’t sound far-fetched to me if aliens ever do find that golden record. Hope you enjoy the music.